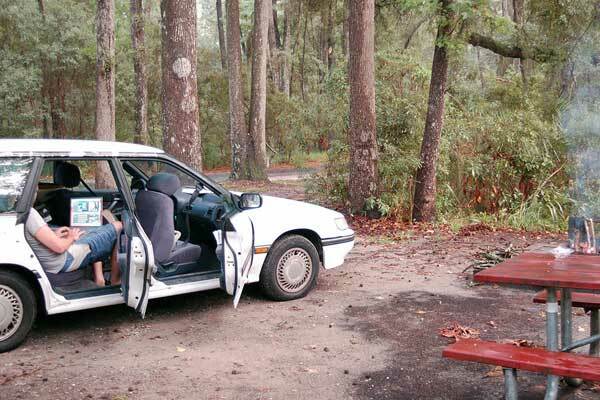 Editing and uploading a video interview at a campsite in Savannah, Georgia. In the days when web journalism meant html and little else, I took the New Media concentration at the Columbia University Graduate School of Journalism, under tech guru Sree Sreenivasan. Most things on the web have changed since then, but I’ve managed to keep abreast of current trends and to put them to good use — including in the creation of this site. I recently worked as the web editor at Feet in 2 Worlds, an innovative program at The New School University in New York that trains foreign-born journalists in public radio production and online news. There, I assigned and edited stories and managed the program’s online presence, which went under my watch from a simple WordPress blog to the current dynamic news website, while traffic increased sevenfold in a year. In addition, I managed social networks (including Flickr, Twitter and YouTube), produced and edited multimedia content and blogged several times a week about immigration politics and policies, Hispanics in the U.S. and Spanish-language media. On Election Day 2008, I edited and published stories by eight foreign-born reporters across the U.S. including photos, videos, audio clips and radio appearances portraying the immigrant vote in a historic election. In August 2008, I created a unique web experiment: NY·DF, The Road to the Latino Vote, a live multimedia blog on Latinos and the U.S. presidential election, which I wrote from aboard a 1992 Subaru Legacy along a roadtrip from New York City to Mexico City. I’ve been an active blogger (here) since 2006 and tweeter (here) since 2007, writing mostly on journalism, although my tweets often digress into soccer.